The story of Unbroken is a story of strong emotions, unresolved conflict, physical and emotional suffering, and ultimately of forgiveness and redemption. If you have seen the movie, the internal conflict that Louie suffered as a prisoner of war was very underplayed. This conflict is central to the book. The other weak element in the movie is redemption through forgiveness. The book brings to light the unlikely ability to ever recover from the physical and emotional torture that Louie endured. The resolution is that he does just that. As Louie is singled out for inhumane, undeserved torture he makes a decision to not comply. His spirit will not be broken. His decision leads to more and more torture - always being singled out. Hatred and revenge drive him. He plots to strangle the Bird, his captor who unmercifully singles him out for the harshest treatment. The opportunity to kill the Bird does not present itself, so he is left with an even stronger drive to "even the score" somehow, someday. Arriving home is not that glorious for him. He is broken. He cannot return to life as it was. He had been training for the Olympics. Now, he is a different man. He turns to alcohol and away from his family. He is tortured still by nightmares that haunt him. His days of captivity are never far from his mind. Killing the Bird is still driving his hatred. He is still captive. As he withdraws from his own freedom, his wife urges him to deal with the demons that are destroying him. After much resistance, he realizes that he can be forgiven for his own hatred and desire for vengeance and likewise forgive his debtors. His forgiveness is evidenced by his decision to travel and find his captors and forgive them face to face. He returns to the very towns that held him captive. What a contrast to his former thoughts of returning evil for evil! Now he is truly "unbroken". He is at peace and true life replaces his brokenness. That is the resolution to the book - forgiveness that results in redemption. 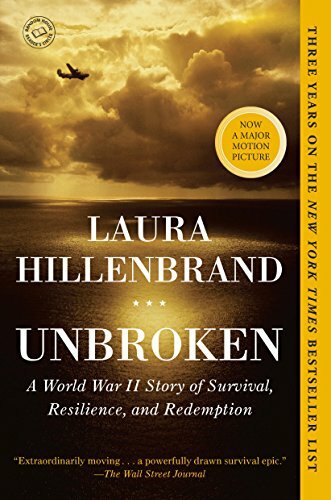 I hope you will enjoy reading Unbroken as much as I did. I've heard that the movie is powerful, but in many ways painful to watch. The man went through so much. Most of us couldn't imagine and that's probably a good thing. We are in such debt to men and women who protect our freedom.